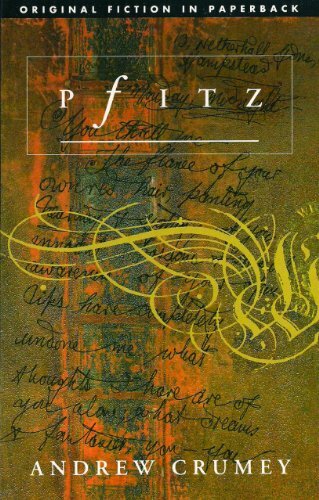 "Pfitz is a surprisingly warm and likeable book, a combination of intellectual high-wire act and good traditional storytelling with a population of lovers and madmen we do care about, despite their advertised fictionality. Certainly Crumey's narrative gymnastics have not affected his ability to create strong, fleshy characters, and none more fleshy, more fleshly, than Frau Luppen, Schenck's middle-aged landlady, a great blown rose of a woman who express her affection for her lodger by feeding him bowls of inedible stew." "Rreinnstadt is a place which exists nowhere - the conception of a 18th century prince who devotes his time, and that of his subjects, to laying down on paper the architecture and street-plans of this great, yet illusory city. Its inhabitants must also be devised: artists and authors, their fictional lives and works, all concocted by different departments. When Schenck, a worker in the Cartography Office, discovers the 'existence' of Pfitz, a manservant visiting Rreinnstadt, he sets about illicitly recreating Pfitz's life. Crumey is a daring writer: using the stuff of fairy tales, he ponders the difference between fact and fiction, weaving together philosophy and fantasy to create a magical, witty novel." If you have any questions about this product by Dedalus Limited, contact us by completing and submitting the form below. If you are looking for a specif part number, please include it with your message.